Harryville Homers racked up double figures once again as their relentless charge to a third league title continued at the weekend. 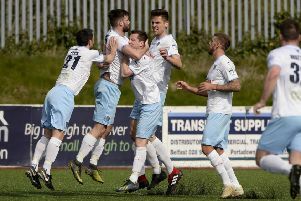 Robert Duddy’s men thumped relegation-threatened Michelin 11-0 as they continue to close in on another firmus energy-sponsored BSML championship. Harryville Homers 11, Michelin 0: Michelin’s defence was breached as early as the opening minute when Jason Ritchie scored a first minute back post header from a David Nicholl corner. Nicholl himself then scored a quick fire hat trick with two Alan Rainey assists and a defensive mix up. Jasin Magill scored the next showing his poacher’s instincts. Alan Rainey scored number six from another David Nicholl assist. A Gary Baird back post header from another David Nicholl centre completed the first half scoring. There was no let up in the second half with Alan Rainey rising highest in the box to head in number eight just before Jasin Magill won the race for the Gary Bonnes through ball before lofting the ball over the advancing keepers head for number nine. Jasin Magill completed his hat trick by rifling into the roof of the net from a Gary Bonnes knock down before Alan Rainey made it a hat trick of hat tricks for The Harryville side as they closed the gap on league leaders Carniny, keeping an eighth consecutive clean sheet in the process. FC Moylena 0, Ahoghill Thistle 7: Thistle kept up their title challenge with this comprehensive demolition over Moylena. Thistle soon settled and took the lead on 20 minutes when David Tennant laid a George Courtney cross into the path of Matt Boyd to fire into the bottom corner. In 15 second half minutes Thistle hit Moylena with five goals. It was 2-0 on 47 minutes when Ryan Sands ran onto a David Tennant flick to slot past the advancing Moylena keeper. David Drummond then got in on the act as he made it 3-0 after playing a one two with Matt Boyd before firing home. Thistle made it 4-0 when Alan Moore picked out Ryan Sands with a left wing cross to volley home. Ryan Sands completed his hat trick not long after this when he again volleyed home an Alan Moore cross. Moylena had no answer for Thistle in the game and Matt Boyd showed his predatory instincts when he smashed the ball home from close range in a goal mouth scramble to make it 6-0. Captain Jason Stewart completed the rout for Thistle with five minutes left on the clock when he was played in by a lovely reversed pass from Matt Boyd to make it 7-0 and secure a vital win for Thistle. FC Penarol 0, Seven Towers 2: Towers continued their recent good form with this victory over Division One side Penarol to make it into the next round. The opening goal came after two minutes when John Miskella was on hand to fire home a Colin Corry corner kick. This goal gave Towers belief and they continued to dominate the game making it 2-0 on 16 minutes. A Colin Corry cross deceived the Penarol defence and the ball fell to Chris Graham to slot past Penarol keeper Paul Bell. Penarol gradually played their way into the game and Melvin Murphy forced a great save out of Mark Wilson in the Towers goal as Penarol tried hard to get back into the game. Penarol pushed to get back into the game in the second half but found Towers defence in stubborn form with John Miskella and Marcus Handford defending well to keep Penarol out and send Towers into the next round. Rectory Rovers 2, Randalstown 4: Randalstown gave themselves a great chance of making it into the final of the Sammy Moore with this hard fought victory over Rovers in the first leg of their semi-final. Champions elect Randalstown took the game to Rovers from the start and got a goal on 20 minutes when Andy Campbell split the home defence for Ian Murray to race clear and slip the ball under Ciaran Cassley in the Rovers goal. Three minutes later it was 2-0 when a John Kitson shot was parried out by Ciaran Cassley to Ian Murray to score his second goal of the game. The second half saw Rovers push hard to get back in the game, but they were very wasteful in front of goals with Gerard Sloan and Alex Telford not making the most of good attacking positions. With 20 minutes to go Rovers got a goal back when Gerard Sloan raced onto a Chris Brady through ball to score. Two minutes later Randalstown keeper David Waddell kept his side in front when he saved at the feet of Gerard Sloan. Randalstown then regained their two goal cushion when they caught Rovers on the break with John Kitson racing clear to score. Rovers still fought back and got to within a goal again when a Paul Donegan close range shot came back off the post and Diarmuid McNally was on hand to fire home the rebound. Rovers pushed hard to draw level late on but in the dying minutes they were hit with a sucker punch when John Kitson scored to make it 4-2 and give his side a healthy advantage going into the second leg. The other semi final saw Templepatrick rUn out convincing 13-7 aggregate winners against Wakehurst Star. After holding a 7-5 lead from the first leg Templepatrick eased into the final as they raced into a 5-0 first half lead thanks to a brace from Jay Woods, Caolan McKeown, John Knox and an own goal. Star fought back in the second half with goals from Stephen Quigley and Matt Logan but Templepatrick scored a sixth through Caolan McKeown to seal a place in the final. firmus energy Division Two: Ahoghill Rovers 1, Glenravel 3; Braid United 1, Lisnafillan Swifts 3; Carnlough Swifts 2, Riverdale 1; Cloughmills 5, Holywell 2; Galgorm Blues 5, Cullybackey Olympic 0; Waveney Swifts 0, St Comgalls 0.
firmus energy BSML Division Three: Woodside 4, Sporting Ballymoney 5. Saturday, March 21 (10.15am) - Rainey Cup, round two: Steadfast v Woodside (Galgorm). firmus energy Division One: All Saints OB v Ahoghill Thistle (Showgrounds 5); Ballykeel v FC Antrim (Ballykeel); Carniny Rangers v FC Penarol (Wakehurst 1); Harryville Homers v Clough Rangers (Wakehurst 2); Raceview v Connor (Broughshane). firmus energy Division Two: Ahoghill Rovers v Braid United (Ahoghill); Cloughmills v Riverdale; Cullybackey Olympic v Holywell (Tober Park); Glenravel v Newpark Olympic (Showgrounds 4); Waveney Swifts v Lisnafillan Swifts (Waveney 2). firmus energy Division Three: Atletico Antrim v Wakehurst Olympic (Forum); Cushendall v Rectory Rovers; Templepatrick v Sporting Ballymoney (Forum).